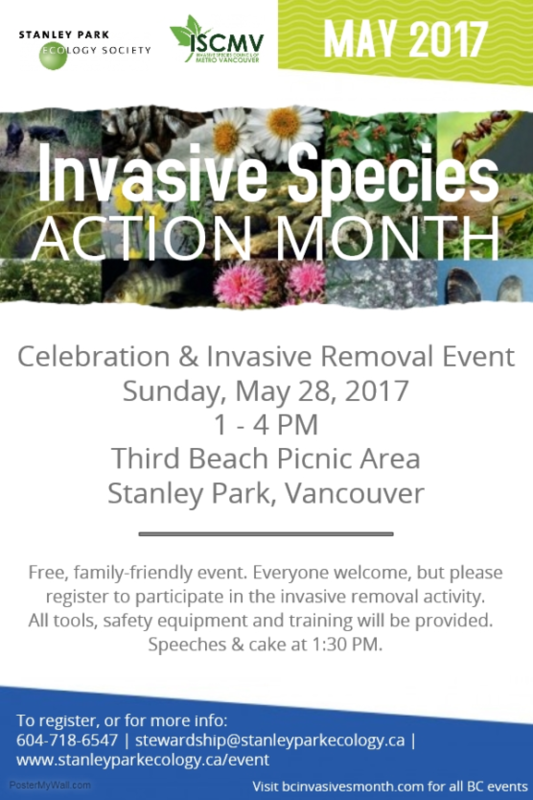 May is Invasive Species Action Month in BC! Natural habitats are being threatened by invasive species in Stanley Park, but the Stanley Park Ecology Society in partnership with the Invasive Species Council of Metro Vancouver and the Vancouver Park Board is one step ahead of species like English ivy, Himalayan blackberry, and yellow flag iris. Join us for a special celebration and invasive removal event on May 28th from 1 – 4 p.m. If you would like to join the invasive species removal activity, please fill out the form below to be added to our event mailing list. A confirmation email with more details will be sent out closer to the event. For more information, please contact Stewardship@stanleyparkecology.ca, or call 604-718-6547.